Constantine VI was Byzantine Emperor from 780 to 797. The only child of Emperor Leo IV, Constantine was named co-emperor with him at the age of five in 776 and succeeded him as sole Emperor in 780, aged nine. His mother Irene exercised control over him as regent until 790, assisted by her chief minister Staurakios. Though the regency lost power when Constantine reached maturity in 790, Irene continued to attempt to exercise control, and retained the title of Empress. Constantine suffered military defeats and made unpopular decisions, such as marrying his mistress, Theodote. 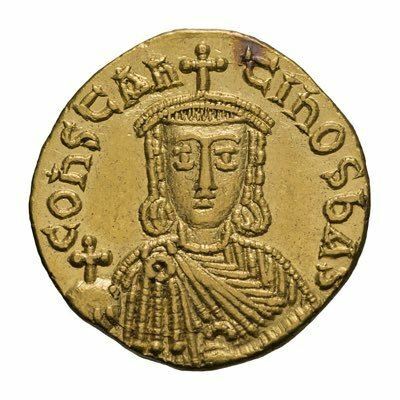 Irene had Constantine deposed, blinded and imprisoned in 797 and seized power for herself, becoming the first Empress regnant of the Empire. Constantine likely died shortly thereafter. Constantine VI was the final ruler to be universally recognized as Roman Emperor, being recognized as such by both the East Roman Empire which he ruled, and the papacy and the Western European powers over which it held suzerainty. With his mother becoming Empress regnant, the papacy crowned Charlemagne as a new Emperor in Western Europe, asserting that a woman could not be Empress in her own right, and laid the foundations of a new polity, independent of the East, that would evolve into the "Holy Roman Empire".